Someone Once Said...: What Would Jesus Do? I was at the mall with my friend and she wanted to look at shoes. We walked into one of her fave stores which sells expensive and gorgeous shoes. The moment we walked in I was blinded by the florescent pink on the SA's face. It was like her blush attacked her and won. She had blotches of bright, hideous pink on her cheeks, her chin and......the tip of her nose. No. She did not have a cold. It was blush. 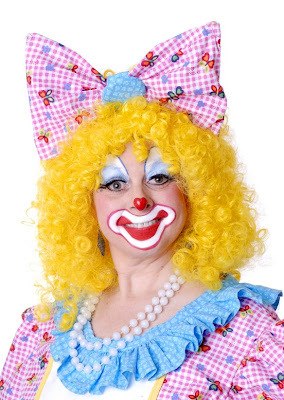 While I was trying to figure out whether or not I should tell her: "Chica, Bozo called, he wants his clown paints back", or something equally as witty while remaining subtle and respectful, another SA walked up with identical, hysterical, allergic makeup. I immediately diverted my eyes, first because they were bleeding, and also because I couldn't stop staring. It's like when you're a kid and someone says not to look directly at the sun, or at an eclipse, or a terrible road accident - you have to look. They girls must have thought I was autistic because I was trying to avoid looking directly at them and in doing so I looked like a loco. Here's my dilema: do I say something. On the one hand I couldn't sit idly by while a another human being made a mockery of the cosmetic institution and majorly embarrassed herself in the process - without her knowledge. I am a firm believer in right and wrong - when I see evil I have to do something about it. On the other hand, I know I would have offended and deeply embarrassed them (not that they weren't doing a fine job of it all on their own), and possibly have made the other people in the store break out in unbridled laughter - cause you know they were doing their best to hold it in. So, my question is: What would Jesus do? What should I do when I see someone who is either color blind, insane, ridiculous, or put their makeup on in the dark, should I say something? I tell people if they have spinach in their teeth (not strangers - often), or if their fly is down -- is crazy clown makeup any different.....Or is it worse? I still don't know what to do. I would like to say that this is an isolated incident, but it happens to me all the time. I see the weirdest Tim Burton creatures lurking around and it takes all the self-control I have not to pull out a baby wipe and rub like there's no tomorrow - and apply a pretty layer of the right stuff afterwards, of course. Ahahahaahahaha!! Yes, this is one of those dilemmas as old as time... say or don't say. Haha, picture's great! Ahahahah! That's as bad as someone having a boogie hanging out of their nose, ewww! Where to turn? Where to look? What to say?! Oh, What a Week I'm Having!